October 10 from 5 to 7:30 p.m.
As part of the Oral History Association Annual Conference Opening and Vernissage for the History Inhabits Each of Us group exhibition, McConnell Building Ground Floor Atrium and Second Floor. 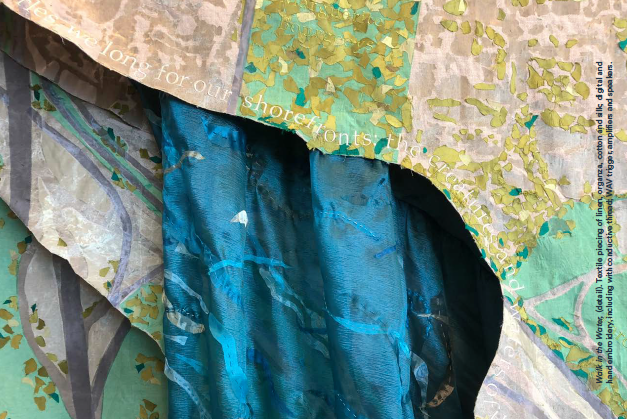 Measuring nine feet high by twelve feet wide, this ‘talking textile’ artwork in map form invites visitors to learn about the St. Lawrence river’s Pointe-Saint-Charles shoreline with touch-sensitive audio playback. Hear about this under-loved waterway through resident and expert interviews and archival material. A project by Kathleen Vaughan, Concordia University Chair of Socially Engaged Art and Public Pedagogies, with the assistance of Jill Bennett, Joanna Donehower, Emma Hoch, RythÂ Kesselring, Jacob Le Gallais, Philip Lichti, Nicole Macoretta, Gen Moisan, Kay Noele, Martin Peach and Eric Powell, as well as special funding from Concordia University.